CAPE TOWN, South Africa, April 28, 2011 (ENS) – Two game rangers dedicated to rhino conservation will take the first step of a walk from the northern border to the southern tip of South Africa on May 2. Their goal – raising public awareness and funds to fight the poachers that have killed over 500 South African rhinos in the past two years. Veteran game ranger Paul Jennings and former ranger Sboniso Phakati, called Spoon, conceived the Rights for Rhinos campaign journey in response to illegal rhino killings in South Africa that have nearly tripled from 122 in 2009 to 333 last year. “The world has to be educated about the plight of the rhino and how important it is for mankind to be a part of conservation efforts to save these beautiful animals,” says Jennings. The Rights for Rhinos walk is the realization of a long-held dream for Jennings, who developed a strong bond with rhinos during seven years as a rhino capture officer with the Natal Parks Board’s game capture unit, which specialized in the relocation of rhino and other species. “Rhino are very close to my heart,” says Jennings, who has witnessed the atrocities inflicted on the animals for their horns. “The methods used are often exceptionally cruel and the animals suffer immense pain before dying of their wounds,” he says. Jennings and Phakati will stop at schools along their 1,700 km (1,056 mile) route to talk about the importance of conservation. Phakati is a public relations specialist with Protrack, a private anti-poaching unit which formed the Hoedspruit Rhino Watch to patrol the Manyeleti Reserve for poachers. Early in 2011, Phakati attended his first rhino autopsy on a farm in the area. He described the sight as “heart-wrenching” and says it made him realize that he wants to reach as many people as possible to make them understand how pointless rhino killings are and how many rhinos are still paying the price. “We need to get more youth involved in raising awareness about what’s happening to our common heritage,” he said. Nissan South Africa is supporting Rights for Rhinos by providing a back-up vehicle for the walk, Adidas is providing shoes and clothing, and RO3 Oasis is providing super oxygenated water for the walk, which is expected to take about three months. 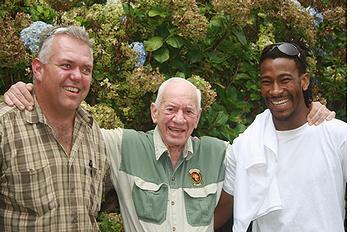 The two rangers have attracted the support of environmental statesman Dr. Ian Player, 84, for their Rights for Rhinos walk. Dr. Player spearheaded Operation Rhino, which saved the last few southern white rhinos from extinction, and founded the multi-racial Wilderness Leadership School. He championed protected status for the Umfolozi and St. Lucia Wilderness Areas, the first wilderness areas to be designated in South Africa and on the African continent. “It is imperative that the plight of these animals is brought into the spotlight, and the Rights for Rhinos walk will achieve this,” Dr. Player said. 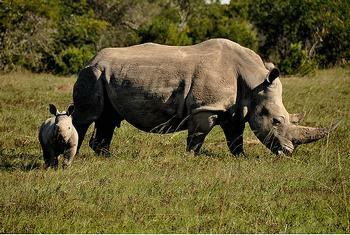 The South African authorities are taking rhino poaching seriously. Earlier this month, two men were each sentenced to 20 years in prison for illegally hunting a rhinoceros and unlawfully possessing firearms and ammunition in Hluhluwe-iMfolozi Park on December 25, 2009. Both men were wounded and another suspect was killed during a shoot-out with park rangers before they were taken into custody. Ballistic analysis linked the firearms to a dead rhino found nearby and the horns recovered were linked by DNA analysis to the same carcass. This is the first successful prosecution in which a DNA comparison was used in securing a conviction in a case of illegal rhino hunting in South Africa. On their Rights for Rhinos walk, Jennings and Phakati will be raising funds for the Game Rangers Association of Africa to assist identified reserves combat rhino poaching. Resources will be directed at improved education programs, more efficient rhino protection equipment, and superior intelligence-gathering, currently carried out in tandem with law enforcement agencies. 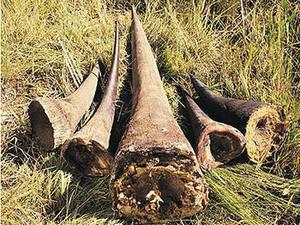 The demand for rhino horn has recently increased based on an unsubstantiated rumor that grinding and drinking the horn substance, keratin, can cure cancer. Keratin is a type of protein found in human skin, hair, and nails and the hooves and horns of animals. Keratins are used as diagnostic tumor markers, but have no role in curing cancer. Nevertheless, rhino poaching reached an all-time high in Africa last year. The wildlife trade monitoring group TRAFFIC states that between 2000 and 2007, South Africa averaged about 12 rhino poached each year. But in 2008, the figure reached 78, and by 2010 it hit an unprecedented 333 animals. Already this year, more than 80 rhino have been poached. Dr. Richard Emslie, scientific officer for the IUCN Species Survival Commission’s African Rhino Specialist Group expressed concern for rhino survival after a meeting of Africa’s top rhino experts in South Africa in March. “Although good biological management and anti-poaching efforts have led to modest population gains for both species of African rhino, we are still very concerned about the increasing involvement of organized criminal poaching networks, and that, unless the rapid escalation in poaching in recent years can be halted, continental rhino numbers could once again start to decline,” he said. Black rhinos, Diceros bicornis, currently number 4,840, up from 4,240 in 2007. White rhinos, Ceratotherium simum, are more numerous, with a population of 20,150, up from 17,500 in 2007, according to the IUCN. Population numbers are increasing, but with the rise in poaching, there is still cause for concern due to inadequate funding to combat well-equipped, sophisticated organized wildlife crime syndicates.